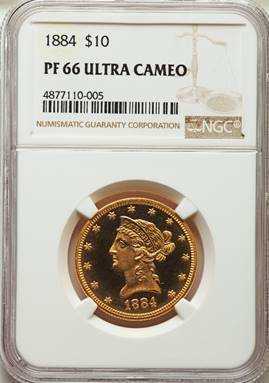 Only 45 proof Liberty eagles were struck in 1884, the lowest production total for any gold denomination that year. Thirty pieces were delivered for inclusion in the proof sets on January 19, with another 15 coins delivered at intervals throughout the year. The proof sets were almost all broken up in the early-mid 20th century, due to pressure from date collectors seeking an example of the double eagle, which was a proof-only issue. PCGS CoinFacts estimates the surviving population of the proof eagle at 16-20 examples in all grades. This is a spectacular looking example with extraordinary eye appeal. 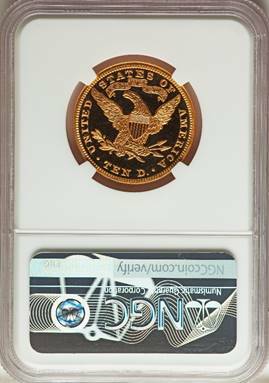 Unpriced in both the NGC and PCGS price guides in this grade and designation. It is tied with one other for highest graded by NGC, while PCGS hasn’t graded a Deep Cameo higher than PR65. Next Next post: Order the Aztec Calendar Rounds today!